Modern anesthesia delivery at an affordable price. 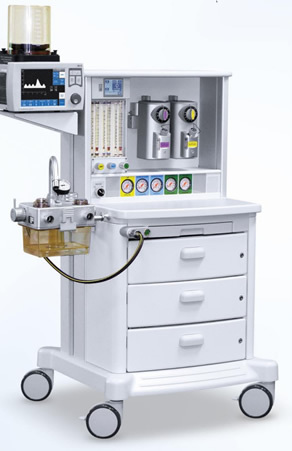 The DRE Ventura CS2 is an anesthesia machine featuring a touchscreen ventilator with advanced ventilation parameters. Featuring a pull-out writing shelf, an integrated oxygen monitor, an autoclavable absorber and locking drawers for added security. Adult, pediatric and neonatal modes. Constructed of high quality American and European materials. CO2 absorber is autoclavable (excluding the manometer). In the off mode, you can remove and refill the absorber canister without losing fresh gas. Two/three gas machine with a two-station Selectatec® backbar with up to four cylinder yokes. The oxygen flush is mounted next to the common gas outlet and is recessed for safety. Both sides of the machine incorporate the GCX™-style tee-slot for mounting ventilators, monitors and other ancillary equipment.